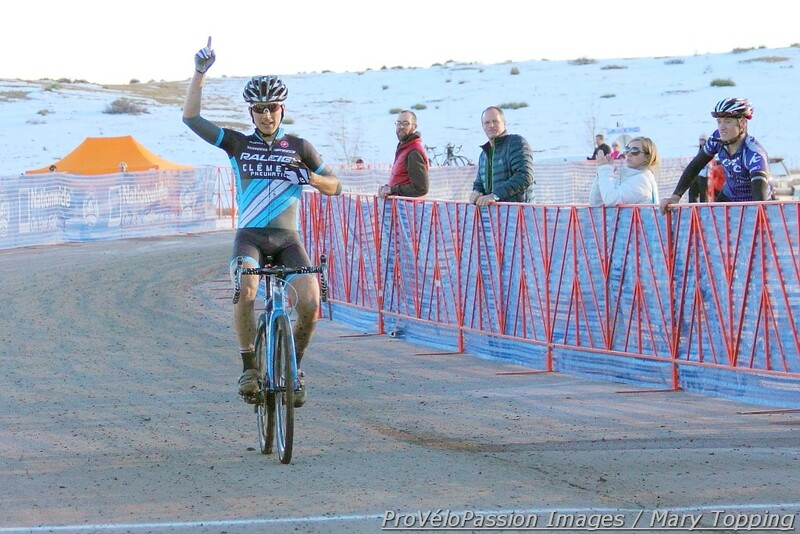 This year’s elite men’s Colorado state cyclocross championship satisfied on so many levels. Allen Krughoff (Raleigh Clement) stood on the top of the podium after two years of coming close. Ten percent of the starters were juniors. Among them, Gage Hecht (Team Specialized Racing) put up a fight for first that rivaled the effort of more experienced elite American racers in the sport of cyclocross. Brady Kappius (Clif Bar) showed once again he’s one of the fastest starters in the sport. Robin Eckmann (California Giant Berry Farms/Specialized) emptied himself to make it three titles in a row for his family with two-time winner and brother Yannick absent. Colombian and Colorado Springs area resident Fernando Riveros, a mountain biker riding for sponsor Rotor without any points for call-up, picked off 60 riders to finish in fourth. Pete Webber (Boulder Cycle Sport) proved again a guy doesn’t have to be 25 to get great results and he’s a threat for upcoming nationals. Riders who had just completed the single speed race went at it again: Colby Pearce (Trek), Nic Handy (Alpha Bicycle Co.), and Drew Christopher (Primal-McDonald Audi), among others. To a man from age 15 to 50 the pack raced with hearts in overdrive, whether it was for the win, to participate in one of the biggest days of Colorado cyclocross racing, or to find their best. And now Krughoff is best in the state. There’s a lot to read into that label for this rider who has raced a heavy UCI ‘cross schedule the last two years with more top ten’s per race this year than last. 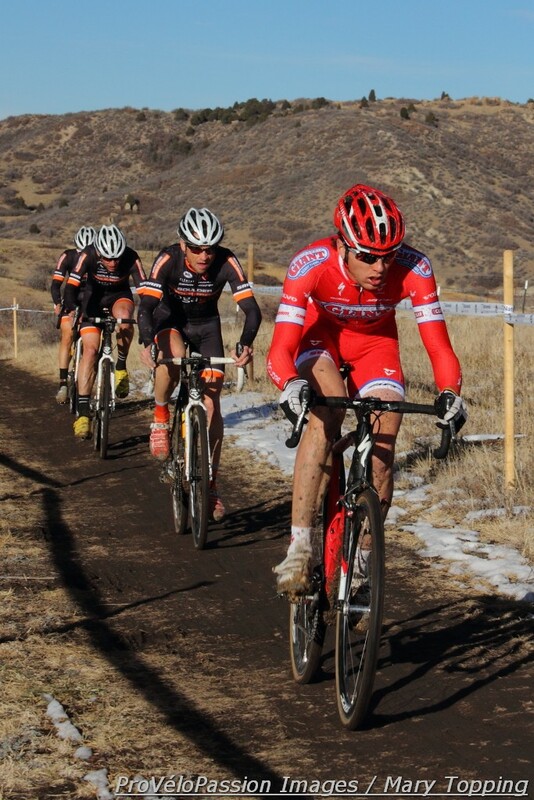 After seasons of NRC road racing, Krughoff dedicated his efforts to cyclocross in 2011. Prior to that time he tackled primarily local ‘cross races. Achieving top ten’s versus the best riders in the country is no small feat. The next step, to reach top five or the podium against that kind of competition, has many days got to feel like a monumental task. Hanging in there requires more than great legs. It demands an inner reservoir of faith in one’s potential. As he stood on the podium Sunday and brushed his hands up and down the champion’s vest on his torso, Krughoff topped up that critical resource. Fifteen year-old Gage Hecht may have come second best on Sunday, but like junior Katie Clouse in the elite women’s contest, he stole the show. Hecht wasn’t content to just ride on Krughoff’s wheel for the first half of the race. The junior won the holeshot. He put in the effort to move to the front. He mastered the long run-up that challenged nearly every contender. “Gage was amazing. 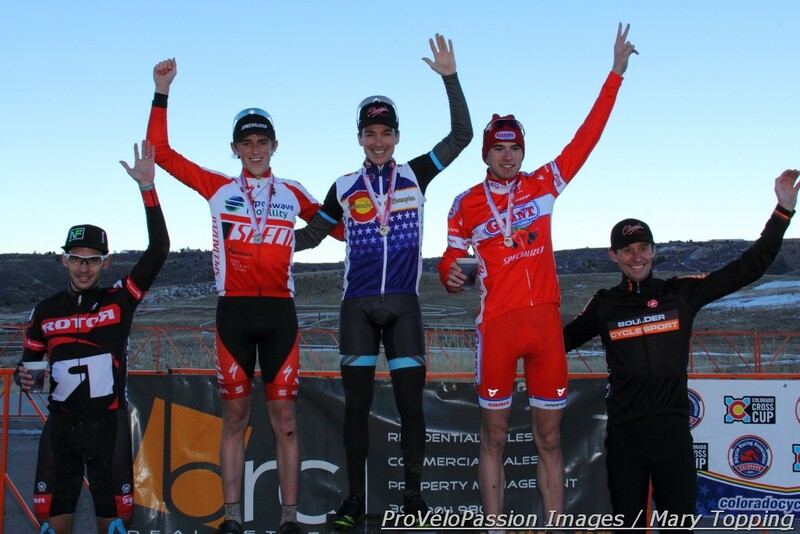 That’s the future of Colorado cyclocross if not the country,” the new state champion said after the race. “Gage put time into me on the run-up. I don’t know what it was but I just couldn’t get good footing or something. He had it figured out.” On the run-up and the muddy false flat that followed, Hecht flew. The medals and championship jerseys and vests that belong to Hecht could probably fill a walk-in closet. He’s a triple road-discipline national champion. 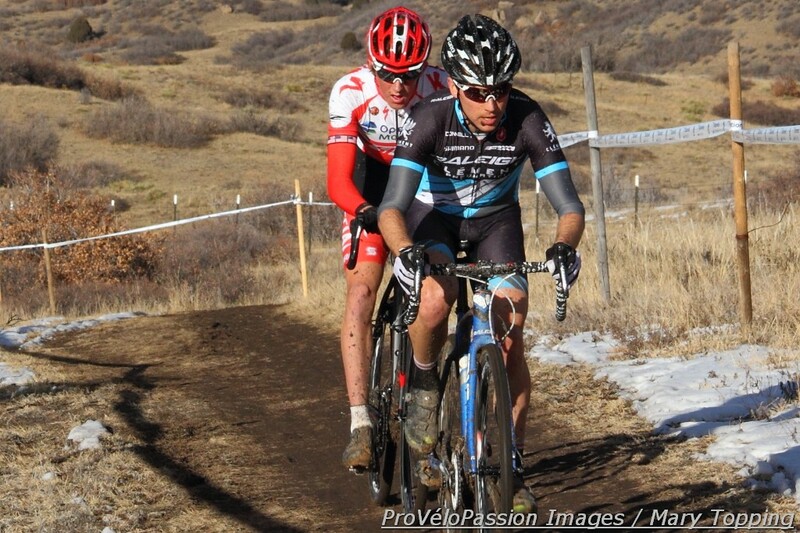 In January he’ll aim for his fifth straight national cyclocross title. Through all that success, which has to generate at least some pressure of expectation, he’s always seems happy. When Krughoff dropped him he didn’t get frustrated. “I was happy where I was,” Hecht said post-race. “Not like I was happy about it but I wasn’t mad that he did it. I was fully expecting somebody to do something like that in that position. “But it was awesome,” Hecht added. Awesome to take on a challenge. Awesome, to be present. After Hecht captured the holeshot, Kappius swept past the junior in the space of a few feet and took the next turn first. Right behind Hecht were Krughoff and some of the fastest men of the local season: Feedback Sports’ Tim Allen, Spencer Powlison (Evol Foods), Chris Case (Boulder Cycle Sport), Eckmann in eighth position, and Chris Baddick (Gear Movement) nearby. Lap one delivered a lot of action at the front. Kappius led for about half a lap then Allen took the helm briefly until Krughoff became captain in the muddy west side of the course to see who would join his crew. Hecht signed on and the two opened a gap by the second lap. Allen and Powlison chased together for a couple of turns around the circuit. Behind them a second chase group was forming with Case, Kappius, Baddick, and Eckmann. The Cal Giant rider surged to the front of his group which had dropped Kappius, who eventually exited the race, as well as Baddick and picked up Webber and his teammate Brandon Dwight. Behind them Riveros had flashed by most of the field and by mid-race rode within shouting distance of the Boulder Cycle Sport boys. In one more lap he would pass them on his way to fourth place. As the top ten on course shifted Krughoff and Hecht increased their lead to over thirty seconds. Hecht propelled himself to the front on the west side of the course at least once, and at least once it appeared his partner shut down his effort to move up. Then with about twenty minutes remaining in the race Krughoff set off on his own. Hecht rode alone for the rest of the race and limited Eckmann’s best place to third, though the latter’s tweet suggests he dealt with a fair amount of trouble. Powlison and Allen slipped back to finish seventh and ninth respectively. The Evol Foods rider had arrived feeling less than optimal. “I knew once I started warming up that it would be a bad day,” he later wrote. Riveros and Webber moved forward to claim the last top five places. Dwight and Baddick produced consistent rides for sixth and eighth. Case came in tenth. As was the victory. “I’ve been close in a handful of years. It’s great [to win],” he said. The new champion feels Sunday’s result provides “good momentum” going forward. Over the next few weeks he’ll be at home preparing for cyclocross nationals and thinking about what’s to come next year. 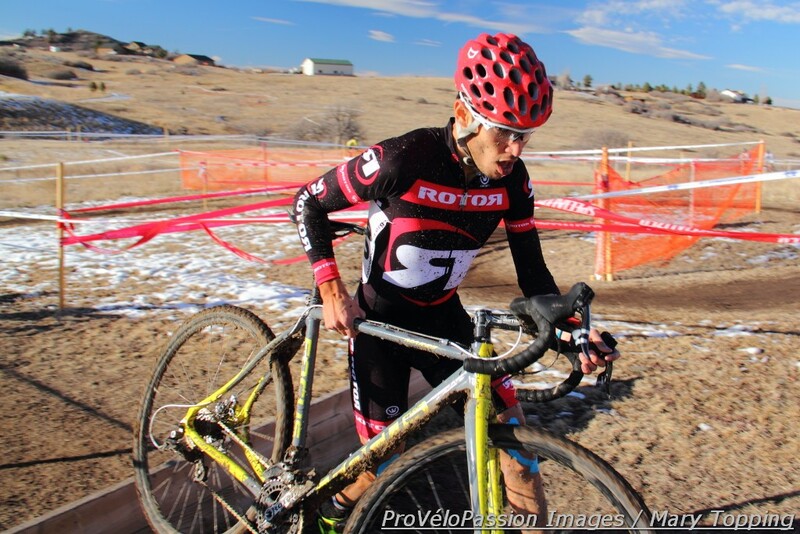 For full results from the Colorado state cyclocross championship men’s elite race, see the Bicycle Racing Association of Colorado website.